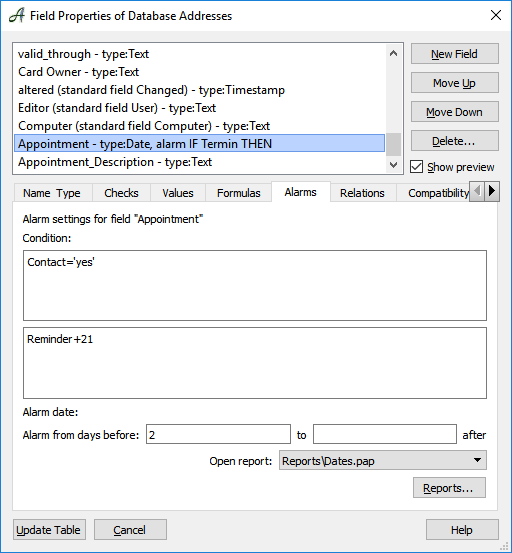 When you start Papyrus, as well as when you click on the alarm icon , all databases will be checked to see whether certain alarm conditions have been met. Then in the “Alarm” tab in the same dialog you can choose when and under which conditions the alarm will sound. The actual alarm date will be entered directly in the record. For example, this allows you to make a “Reminder” field dependent on whether or not an invoice has been paid. That field will then continue to appear as an alarm until you actually go in and remove the condition (meaning that the invoice has been paid and you have entered something other than “outstanding” in the “Payment” field). Under “Alarm from days before” you can enter whether you would like to be notified of the alarm a day in advance. Then you can enter what should happen when the alarm date is reached, or the report that should then be generated. If you have not already prepared an alarm report, you can use the “Reports…” button, which will open the “Report” Dialog, in which you can create a report that will be automatically generated when the alarm goes off. In the “Report” Dialog you can create a normal report, but assign it the special condition that it will be generated when the alarm goes off for that field. The report “Dates.pap,” for example, will generate a list of the company, name, address, and the deadline date. In the entry form you can enter the alarm date. You can also use other fields to determine whether the alarm should go off or not. For example, whether a reminder should go out, could depend on how long it has been since–e.g. the invoice date + 14 days–and a field that states whether the invoice has been paid or not. “Alarms” will be checked each time you open Papyrus; you can also check them manually by hitting the icon in the toolbar. 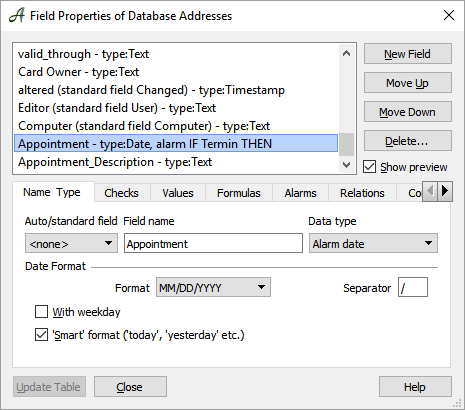 For each database table that contains valid alarms, the appropriate reports will be generated. These reports will contain all records that have met an alarm condition (in the simplest of cases, an alarm date has been reached). A convenient thing about alarm reports is that they create a hyperlink from the report to the original record (as long as this option has been selected for this report template). This allows you to open the related record that set off the alarm simply by clicking on the link. If you want to make sure that your alarm report does not get lost, you can select the checkbox “Save report in folder ‘Auto-Reports.’” Each time a report is generated by an alarm going off, the report will be saved in the “Auto-Reports” folder. 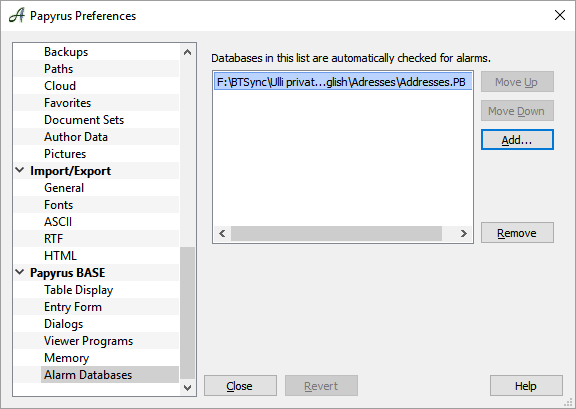 In the Papyrus “Preferences” under “Papyrus Base” → “Alarm Databases” you can set which databases should be checked for any alarms that have gone off when you open Papyrus Base.